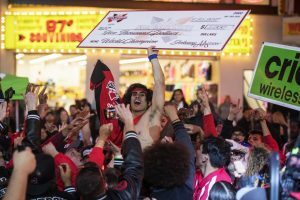 The 19-year-old hid behind plastic sunglasses, scoping out where the competition would take place, along a pedestrian mall in downtown Las Vegas called the Fremont Street Experience. It wasn’t the Strip, but it is known as the second-most-famous street in Sin City, set amid older casinos, musty bars and tattoo parlors. It was Washington’s first time competing in the annual World Sign Spinning Championship, though calling it a world championship is a bit of a stretch. Sure, there are sign spinners from across the country, and even from South Korea and Poland. But all 120 competitors work for Los Angeles-based AArrow Sign Spinners, which claims to have pioneered the use of athletic feats by human billboards. AArrow also hosts the competition, which doubles as a hyperactive company retreat. A week before going to Vegas, Washington previewed his potentially championship-worthy routine for D.C.-area commuters. He parked himself in the intersection of a four-lane road fronting a strip mall in Alexandria, Va. First, he pulled on each of his fingers, grabbed his triceps and stretched his arm across his chest. Then he picked up the 6-foot, 8-pound sign shaped like an arrow. It read: Healthy Back Store. Next, he spun the sign while balancing it flat on one hand like a pizza, before tossing it 10 feet in the air. All the while, he adhered to the philosophy of the AArrow Attention Method: He smiled, waved, made eye contact with drivers and, at the end of a trick, froze for a few seconds so people could read the advertisement. Washington saved his biggest feats, flips and cartwheels, for when the light turned red and he had a captive audience of bored drivers. For this, Washington earns $15 per hour. As an instructor he earns $2.60 for every hour worked by a person he successfully trains. 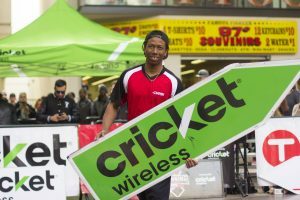 (AArrow won’t send out spinners unless they know about five tricks, said D.C.-area franchise owner Michael Patterson. Only about 20 percent of people survive training.) If Washington lands a new advertiser, he also gets a 10 percent cut of the deal. For Washington, the job let him move out of his parents’ house soon after graduating from high school. But it’s about more than self-sufficiency. When he sees anything resembling the size or weight of a sign, he can’t resist picking it up and spinning it. He studies YouTube videos of other sign spinners and even lives with two other spinners in an apartment they rent for cheap from their boss. “It’s more than spinning a sign. There’s a culture behind it,” he said. The way he talked about it, you’d think he was describing break dancing or graffiti. But it’s not exactly subversive art to make a public spectacle of yourself to get people to look at paid advertisements. Max Durovic and a classmate were not much older than Washington when they founded AArrow Sign Spinners as Georgetown University undergrads in 2002. Durovic got the idea while working a doldrum high school job holding a sign for an apartment complex in California. When he and a friend started spinning them to impress some girls, their boss chided them. From there, Durovic envisioned creating a business that injected aestheticism into the job of human billboards. Durovic, now 33, built AArrow into a global franchise, with operations in Houston, Seattle, Miami and several foreign countries. Clients pay $40 to $60 per hour for a spinner. Around Washington, AArrow has benefited from the apartment and condo boom. Nationally, one of its biggest clients is Uber, which used sign spinners outside gas stations as part of a driver recruitment campaign. AArrow, a private company, had more than $11 million in revenue in 2016, said Durovic. Its success depends on the stamina of AArrow’s 2,000, mostly male, full- and part-time sign spinners. Like Washington, many don’t have a college degree, and that’s partly by design, said Patterson, a Georgetown classmate of Durovic’s. 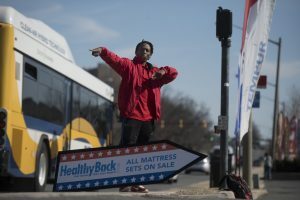 Durovic believes that despite appearances, standing in the middle of Rockville Pike in every conceivable temperature doing cartwheels with a sign for a futon shop is not a dead-end job. “If you can figure out how to sell yourself as a sign spinner, you can do anything,” he said. He strives to help employees advance within AArrow or pursue other career goals, citing a company scholarship fund that has paid for 10 employees to attend college and business school. As the competition’s emcee, he gasped and cheered on the microphone when anyone nailed a gravity-defying trick like a “one-night stand,” in which a person tosses a sign, goes into a one-handed handstand and catches it with his free hand. He had lost his voice by the end of the second day. Durovic didn’t mind that his audience consisted mostly of employees and two scantily dressed women charging people to take photos with them while tourists flew overhead on a zip line. He stood on the stage where the judges sat facing the performance space — an enclosed area about half the size of a basketball court. Despite the spectacle — or maybe because of it — it was hard to tell whether competitive sign spinning is an idiosyncratic sport, or a crafty HR strategy to boost employee retention and productivity. At times, the Vegas event felt like a meeting for a fraternity. 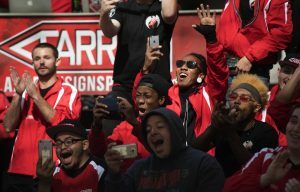 When employees encountered one another, they launched into an “AArrow” call-and-return chant, which consisted of shouting “air-row” over and over, followed by some grunts of the shirtless-guy-who-paints-his-face-for-home-games variety. Academics have a term for this. They call it “job crafting,” when low-prestige occupations are given a loftier purpose. Think “Subway sandwich artist,” said Seth Kaplan, an associate professor of psychology at George Mason University. Or hospital cleaners who, researchers at Wharton, Yale and the University of Michigan observed, see themselves as part of the healing team. HR experts spin job crafting as empowering. But workers’ rights advocates have also derided practices like Walmart having its employees perform a happy chant each morning before starting their minimum-wage jobs. Kendric Washington hails from a working-class neighborhood in Hyattsville, Md., where his parents both are postal workers. A dancer in high school, he was recruited as a part-time sign spinner his sophomore year. He was bullied at school because he was from a poorer neighborhood, he said. And in that neighborhood, he was mugged multiple times, so he mostly kept indoors. He recounted how once, after a shift, he got a standing ovation from employees at a pet store who credited him with bringing in more business. “Everyone was praising me, and I had this overwhelming feeling of excitement because I was just doing my job,” he said. Last year, he won first place in a regional competition, earning him a berth in Vegas. To be a world champ, he would have to survive three rounds consisting of 30-second and 45-second routines of his best tricks set to music. Three judges would assess him on style, technical ability and execution. He would have to place high enough in the first two rounds to make the final. As the first round got underway, Washington sat on some bleachers, watching guys catch signs with their feet while doing handstands. Others did flips or caught signs while spinning on their heads. As Washington watched, his face was frozen in a serious countenance. But when someone performed a move that he deemed impressively improbable, like the successful landing of a “Jamaican Me Crazy” — where a spinner holds the sign between his legs while in a handstand, then lands back on his feet while catching the sign with his hands — Washington cheered. As soon as a routine ended, he rushed to hug the performer. When it was his turn, he unzipped his red AArrow hoodie and received a few handshakes and high-fives as he made his way to perform. Many of the other spinners already knew his videos from social media. A smooth jazz instrumental — Washington’s preferred music to spin to — started blaring as his 30 seconds began. He landed a few flips. He caught the sign in between his legs and sat on it. In a move called the “Patty Cake,” he slapped the sign back and forth with his hands held above his head until the words blurred. After he finished, he led the crowd in the traditional “AArrow” chant. He was among 30 who qualified to move on. For the second round, Washington would get two 45-second tries to place in the top 10 and move on to the final. On his first turn, he executed a series of high-speed twirls but dropped the sign, marring an otherwise impressive routine. He attempted to recover on his second turn with a move he invented that is a cross between a pirouette and a samurai spinning a sword. He finished 13th, not far behind Kacper Krawczyk of Poland, 19. Of course he wanted to do better, but he thought it wasn’t bad for his first time out. He stayed to watch an epic routine by Jose “Mucho” Angeles, from San Francisco, involving shoes with wheels, too many flips to count and a ninja costume. At one point, Angeles, a 22-year-old actor and stuntman, rolled along while juggling three knives and tossing the sign in the air and, yes, catching it. He took first place. When Angeles’s victory was announced, Washington and the other spinners surrounded him, lifting him on their shoulders. There were tears, jubilation and graciousness from the defeated. A week later, Washington would be back standing in some congested suburban D.C. intersection. When the light turned red, a few drivers would smile or honk at the new tricks he learned in Vegas. Others would ignore his attempts at eye contact. When the light turned green, they would drive away. And he would start again.